Rebecca is still looking for the GREEN bear. 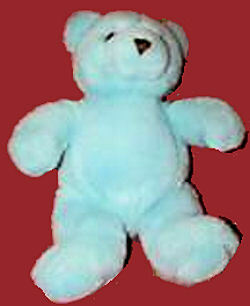 I am looking for a small teddy bear, about 12 inches long, made by GUND Baby Time back in 1986. It has a small rattle inside the stomach and a brown stitched nose. I have had mine ever since I was 5 and would love to try and get the other colors. I need pink, yellow and mint green. Ebay #110651775769 says white but looks more yellow? Think this is the yellow bear. I just found the yellow one on Ebay last week. The last one I need is green but thank you for keeping an eye out.